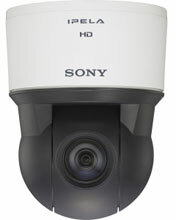 The Sony-Electronics SNC-EP550 camera delivers high quality 720p HD images over a wide area of view with its superb pan, tilt and zoom capabilities. It possesses a powerful 28x optical zoom with 12x digital zoom, giving a total zoom ratio of 336x. The SNC-EP550 supports three compression formats. JPEG is the best choice for high-quality still images, MPEG-4 provides clear video images over limited bandwidth networks, and H.264 is the alternative for severely limited-bandwidth networks, with twice the efficiency of MPEG-4. Optical Day/Night function switches the camera between Day (colour) and Night (B/W) modes, so that in Night mode the camera becomes sensitive to near-IR light and can reproduce images not visible to the naked eye.